Yeah, yeah, we’ve all heard the sad, sad story of the demise of print journalism. Most of the time the story is about hapless journalists trying to figure out what to do in an increasingly wired world that finds their newsprint products increasingly boring and irrelevant. 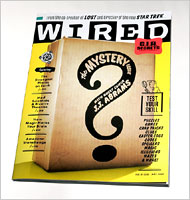 So it is with some relish to see the folks at the print version of Wired magazine (a good read really. Unspun‘s recently taken to buying it from newsstands) come up with a strategy that engages some of its readers. It is too early to tell whether or how this strategy can be played out over successive editions but its good nonetheless to see some ingenuity addressing the issue of making print journalism continuously relevant to its readers instead of the usual whinge. Model Nation #3: Who banned Mother’s entry into Malaysia?